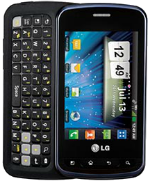 The LG Optimus Zip comes with a full slide-out keyboard and a 3.2-inch capacitive touchscreen display complete with 320x480 resolution. There is an 800MHz processor operating inside the device. The device comes with 150MB built-in memory along with a microSD card slot, where the memory may be expanded by up to 32GB. There is a 3.2MP rear-facing main camera that can record VGA quality videos. The LG Optimus Zip runs Android 2.3.4 Gingerbread OS upon unboxing. With its 1540mAh battery, the phone gets to last up to 6 hours of talk time and 35 days in standby mode.